Free use of the health club and spa - 20-metre pool, sauna and gym. The Hallmark is a relaxed boutique-style hotel, in a quiet location, less than 3 miles (4.8 km) from Manchester Airport and close to road and rail networks. Holiday Parking is on-site with limited security. Add on parking is GBP 5 per day. Vehicles are left at owner's risk. 'Taxi transfer operates 24 hours on request free of charge, approx journey time 10-15 minutes. Brasserie offers a choice of modern European dishes and some good old classics. lounge bar serves a range of hot and cold beverages throughout the day, along with a selection of fresh pastries each morning; tasty bar snacks and light bites at lunchtime; and an early-evening Tapas table. The hotel offers free Wi-Fi throughout, free car parking and free use of the health club and spa; facilities include a 20-metre pool, sauna and gym. Checking in or checking out outside of these times may be possible but will be subject to the hotels availability and may incur an additonal charge. Just one of the many Hotels near Manchester Airport available from FHR. From M60 follow signs to A34 Cheadle. At the roundabout (Stanley Green) turn right onto B5094 and carry on through 2 sets of lights, just prior to the third set, turn immediately left into the Hotel car park. From M6 Junction 20 join M56 toward Manchester Airport. Leave M56 at J5 and follow signs for terminals 1 & 3. At the roundabout follow signs for Cheadle. Turn left at the lights (petrol station on right). Turn right onto Finney Lane at the next set of lights. Travel through Heald Green Village - Griffin Puib on the right, turn right, then continue for one mile, at the 4th set of lights turn left onto Stanley Road and the hotel is on your right. Please note these directions should only be used as a guide. Thank You. We have sent your question to our reservations team and they will update with your answer as soon as possible. Only Required If You Would Like to be Notified When we Answer Your Question. 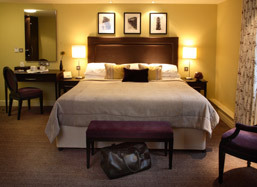 View all Manchester Airport Hotel options available from FHR.